When the channel is busy, using a subject line can help your topic stand out. Adding a subject to your conversation is easy. Just click the button to expand the compose box (it looks like an "A" with a pen) and enter your subject text in the Subject line. Type your message and press Enter to post your new conversation. Conversations in channels can be seen and searched for by the entire team. 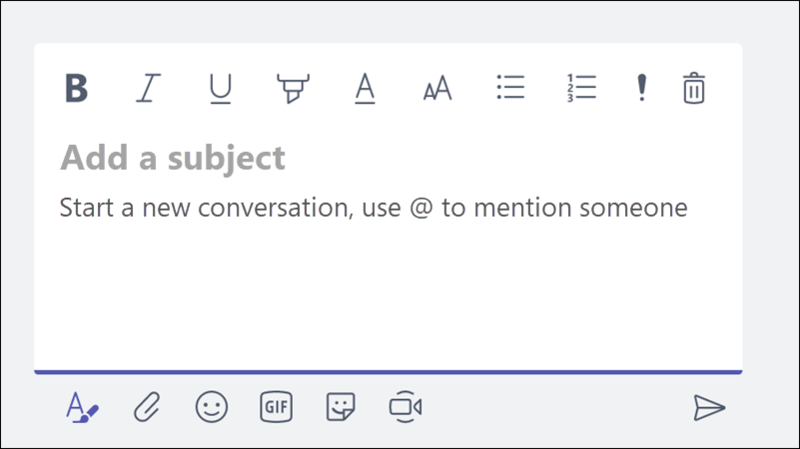 You can participate in conversations, like or save important ones, mention specific people so they see your message, and even edit a file that’s been added to the conversation. Select Reply, add your response, and press Enter. Select next to a message to show you liked it. Select to save a message for later. Select your picture to see your saved messages. Enter your message in the Start a new conversation box, and press Enter. Type in front of a team member’s name while you're creating a message to include them in the conversation. The person will receive an @mention notice. You can @mention a team or channel, if your admin enables it. Look for the circle on the left next to Teams and Activity to see the number of times your name has been mentioned in a conversation. If a document has been uploaded to a conversation or Files, select the file to open it. Select Edit, and then select where to edit the file in the app or online. Select to continue the conversation while viewing or co-editing the file.